Hello ladies and gentlemen, hope you all are doing well. We are here today to share some new ideas with you. With the charms of upcoming summer season did you decide anything about the new wearables for the season to look more stylish and fashionable? If not, than need not worry about that. We could help you out in searching a better item. Almost all the designers are about to unveil their summer collections and the stores are just going to get over crowded soon. 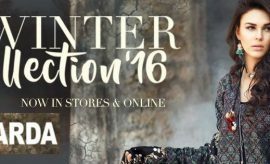 This piece of writing will be featuring the latest and most wanted designs of the Nishat Lawn Summer Collection. It’s time for you to decide a best designer brand for your new summer dresses to look all the more glamorous and unique round the season. But the question is which brand is going to introduce best and unique prints and designs? You can only anticipate this, as none of us can have the idea about the magical designs hitting the designers’ mind before they hit the market. Further, the competition in fashion industry is getting more and more tough day by day, that is not only challenging for the designers, but tricky for the customers too, from the selection point of view. One of the top most brands in the clothing industry is “Nishat Linen” which is famous for production of quality fabrics since 1951, starting from the bed linen to kitchen coordinates. The brand has now been categorized among the top most fashion labels especially for womenswear in Pakistan and is equally popular Internationally now. Women who are interested is wearing quality fabrics but stay within their budget always got for this very popular clothing house. 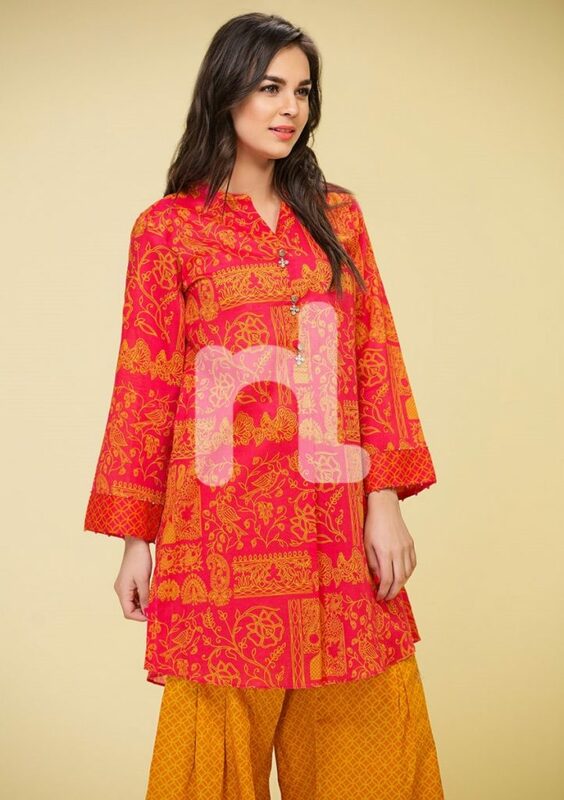 Nishat deals in casual and formal lines of women’s wear under its label Nisha and has a separate sub-label Naqsh for menswear where one can find classy designs of casual and formal wear kurtas and suits for men. The Nishat kids wear category has also been quite popular among the fashion and style loving mothers. Nishat Linen Outlets are located in almost all major cities of Pakistan including Karachi, Lahore, Islamabad, Rawalpindi, Faisalabad, Sargodha, Multan, Gujrat, Gujranwala, Peshawar, Bahawalpur, Sialkot, Abbottabad, Rahim Yar Khan, Mardan, Sahiwal, Mirpur AJK, Jhelum, Sahiwal, Sawat, Haiderabad, Mandi Bahauddin and in UK and UAE as well. 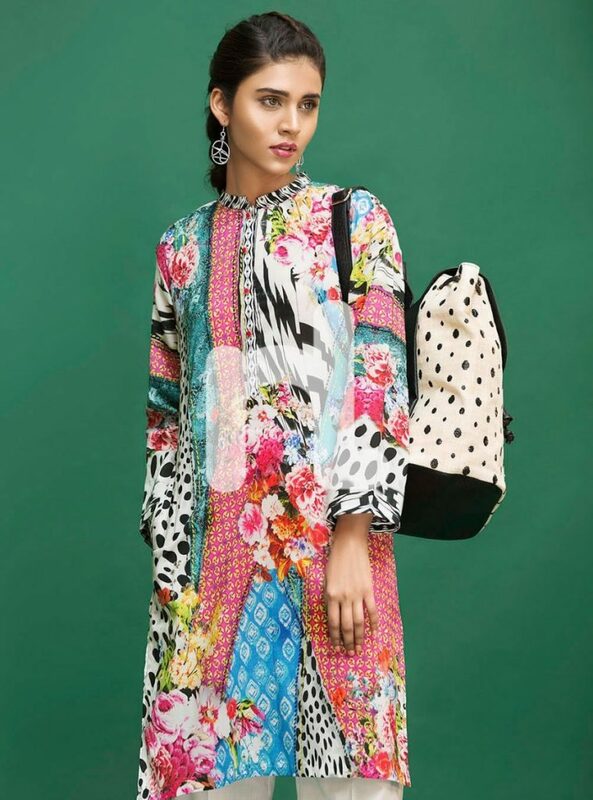 Nisha Nishat Lawn Summer Collection 2018 has been unveiled by the brand a couple of days ago to surprise the public with their devastating prints and designs. The collection this year is full of dazzling summer lawn prints dipped in the flavor of ethnicity and divinity. As always the assortment has been compiled as single, two piece, and three piece lawn suits both in stitched and RTW formats. With the use of bright and eye catching hues, perfect mixing of tints and matching of shades, Nishat has put forward a sensational and worth considering assortment of the season to please its fans. 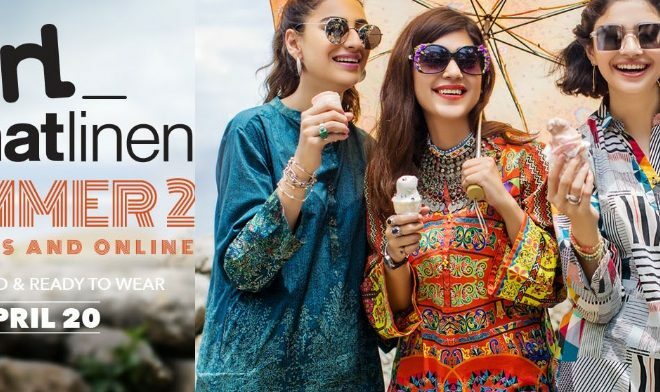 Posted below is the complete Nishat Lawn Summer 2018 Catalog with prices and details. 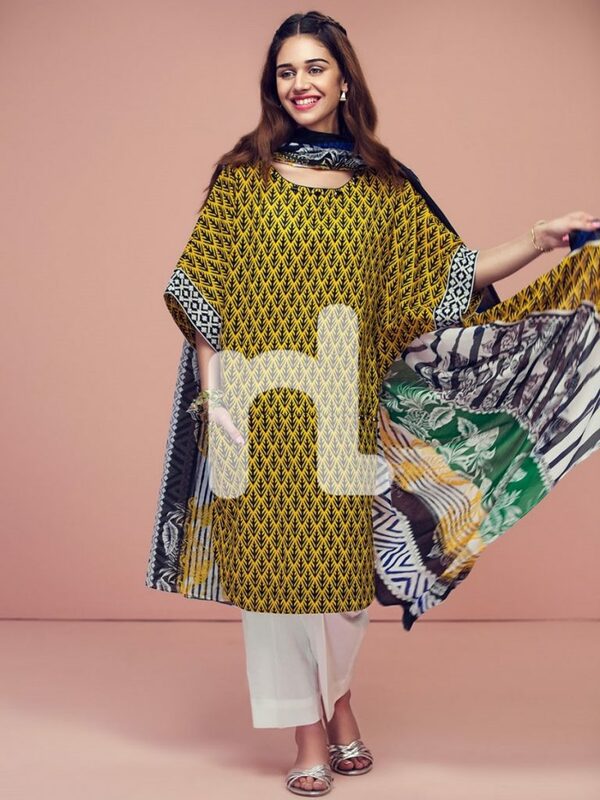 If you are looking for some out of the world designs to make a fashion statement this summer, then be the first one to explore these fabulous Nishat Lawn designs and grab them before they run out of the stock. Though the cost and time of getting dresses stitched is a headache which makes people go for off-the-peg garments yet the charm of getting dresses stitched the very own styles and customizations is also there. Most of the ladies still prefer buying unstitched fabric and get them stitched in certain trendy ways. 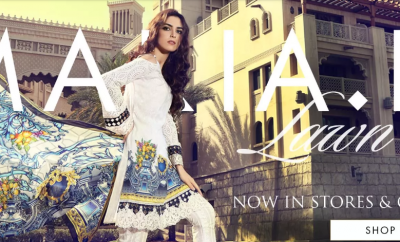 The Nishat Linen Unstitched Summer Collection is the right choice for those ladies. 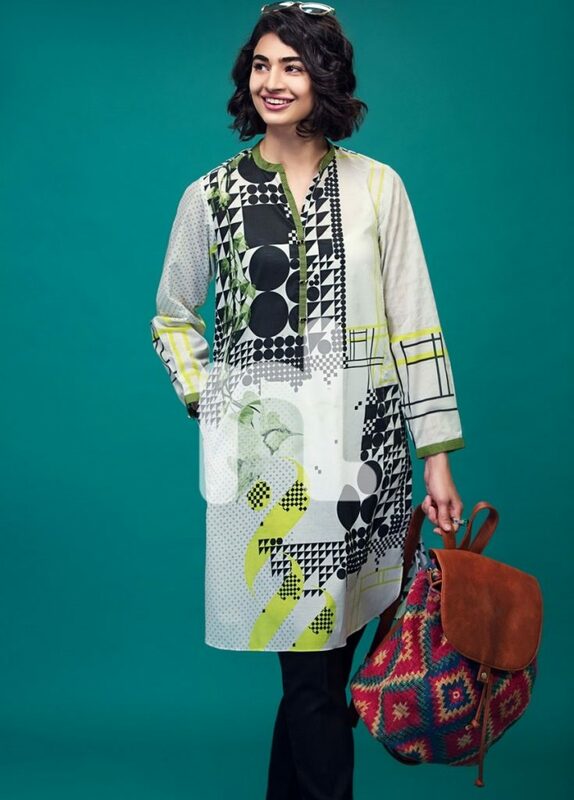 Let’s explore some of the featured designs of the Nishat Unstitched Summer Series in the section below. This beautiful design of three piece unstitched printed lawn suit in vibrant green color has been jeweled up with intricate embroidery, a dyed cambric shalwar and printed Krinckle chiffon wrap. This adorable shade of pink decorated with classy floral embroidery has been paired up with a silk chiffon tie and dye dupatta ready to make a statement this summer. Get ready to wear a perfect summer look with this splendid three piece dotted print of NL embroidered lawn. Yellow is the coolest color to wear in summers. This chic design of yellow by Nishat is all set this season to attract the spectators with its regal look. Buying three piece dress is not always great. Sometimes it’s better to go for single shirts and pair them up with the matching stuff of your own choice. This pretty light green colored single shirt with sizzling digital print is here for you to stand out of the crowd with a bit different style. This beige colored three piece lawn suit has lovely polka dots print all over it and is complimented with a Krinckle chiffon dupatta making it simply perfect to adorn the summer look. 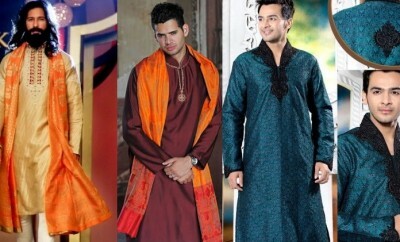 The trend of wearing ready-to-wear kurtas has caught fire in the past few years. This had made designers and brand come up with special PRET collections every season. So is the case with Nishat Linen. Nishat’s latest Summer Lawn collection has a special category of RTW dresses designed with dazzling prints and intricate embroideries. These summer kurtas are stitched so neatly in trendy styles that they can give an extremely classy look when paired with matching tights, pants or jeans etc. Let’s have a look at the featured designs of the RTW series. Feel free to share your views about these mind blowing Nishat Lawn Summer Designs 2017. You can buy these items online by visiting the company’s e-store on the official Nishat Linen website or visit the nearest Nishat outlet today. Stay tuned with StylesGalmour Summer Trends for more summer dress designs.